Design speed is a selected speed used to determine the various geometric features of the roadway. The assumed design speed should be a logical one with respect to the topography, anticipated operating speed, the adjacent land use, and the functional classification of the highway. Design speed is different from the other controlling criteria in that it is a design control, rather than a specific design element. In other words, the selected design speed establishes the range of design values for many of the other geometric elements of the highway (Figure 5). Because of its effect on so much of a highway’s design, the design speed is a fundamental and very important choice that a designer makes. The selected design speed should be high enough so that an appropriate regulatory speed limit will be less than or equal to it. Desirably, the speed at which drivers are operating comfortably will be close to the posted speed limit. In recognition of the wide range of site-specific conditions, constraints, and contexts that designers face, the adopted criteria allow a great deal of design flexibility by providing ranges of values for design speed (see Table 1). For most cases, the ranges provide adequate flexibility for designers to choose an appropriate design speed without the need for a design exception. 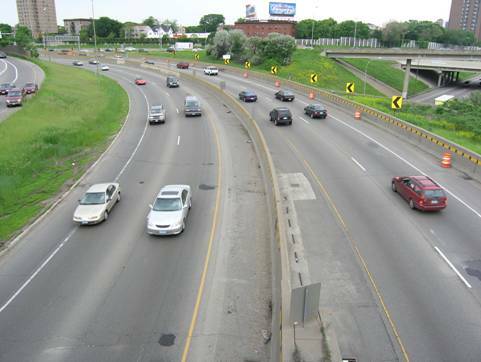 A Guide for Achieving Flexibility in Highway Design (AASHTO) provides additional information on how to apply this flexibility for selecting appropriate design speeds for various roadway types and contexts. For projects on extended alignments, design exceptions will be rare primarily because, as shown in Table 1, the range for acceptable design speeds is broad. If a limited portion of an alignment must be designed to a lower speed, it may be more appropriate to evaluate specific geometric element(s) and treat those as design exceptions (instead of the design control). In the rare instances where a design exception for design speed appears necessary over an extended alignment, it is best to evaluate the expected performance of the continuous alignment to refine the design, and highlight specific locations for mitigation. Because it is a design control, design speed affects the curvature (radius), stopping sight distance, superelevation, and other features of this horizontal curve. Figure 5 is a photo of a curving portion of a highway under traffic, with two lanes in each direction separated by a concrete barrier. Exhibit 10-56 in the Green Book provides "guide values" for selection of ramp design speeds as a function of the highway design speed. According to the Policy, ramp design speeds should not be less than the low range presented in Exhibit 10-56, with other specific guidance offered for particular types of ramps (loops, direct and semi-direct connections). Some States have adopted design policies requiring the use of middle or higher range values for certain cases, such as system interchanges. Designers are occasionally confronted with situations in which the appropriate ramp design speed per Exhibit 10-56 may not be achievable. Such cases are almost always associated with the inability to achieve minimum radius for the controlling curvature of the exit or entrance ramp. Not meeting the lower (50 percent) range per Exhibit 10-56 requires a design exception per FHWA policy. Where the design issue involves curvature, a design exception should be prepared for the non-standard horizontal curve rather than for the use of a lower design speed for the ramp. Research confirms that lower speeds are safer and lowering speed limits can decrease both crash frequency and severity. However, speeds cannot be reduced simply by changing the posted speed limit. Geometric and cross-sectional elements, in combination with the context, establish a driving environment where drivers choose speeds that feel reasonable and comfortable. One tool that designers can use to determine where operating speeds may exceed the design speed on rural two-lane highways is the Design Consistency Module of the IHSDM (see Chapter 1). This module can identify speed discrepancies, both in terms of level of magnitude and length of highway affected. Mitigation strategies can then be targeted to the locations where speed discrepancies are expected. Research suggests that crash risk increases with increasing differentials in speed (Table 2). Such differentials can be between adjoining highway sections (change in 85th percentile speeds due to changes in roadway geometry) or between speeds of vehicles in the same traffic stream (such as trucks and passenger vehicles). Exhibit 3-58 in the Green Book provides information on the crash rate of trucks as a function of the speed differential of trucks to the average running speed of all traffic. Relative Risk of Differential Speed Caused by Changes in Roadway Geometry. A Guide for Achieving Flexibility in Highway Design, AASHTO, 2004. Design Speed, Operating Speed, and Posted Speed Practices, NCHRP Report 504, Transportation Research Board, 2003. A Guide to Best Practices for Achieving Context Sensitive Solutions, NCHRP Report 480, Transportation Research Board, 2002. Highway Safety Design and Operations Guide, AASHTO, 1997.